I read The Rose Garden by Susanna Kearsley because it was a kindle daily deal. 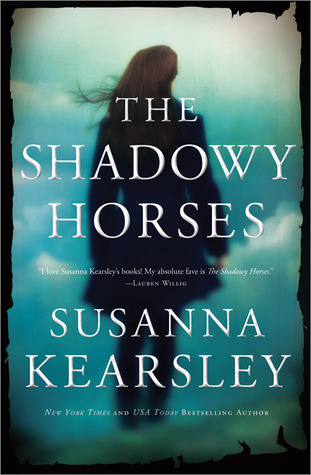 I read Shadowy Horses because I loved Kearsley’s writing. She seems like the kind of person I could sit down with over a cup of coffee and just talk about all the interesting facets of history. She brings the old in with the new and blends them so well, it’s hard to imagine the two worlds not overlapping. In Shadowy Horses, Verity has been hired on as part of an archaeological dig for a vanished Roman army troop. The dig is occurring under strange circumstances. The financier and leader or the group is supposedly a little crazy, Verity dated on of the guys working on the dig and is attracted to the other, and the granddaughter of the leader is an apathetic 20 year old who holds a little resentment towards her grandfather. In addition to the digging group, there’s the family that lives in the caretakers cottage: the cook, the groundskeeper, the fisherman, and the young psychic boy. Everything the dig is looking for is based not in fact, but in feelings. Not only does Kearsley weave together a fantastic story about the archaeological dig and the relationships that form and stretch during the dig, but she also brings the past in and effortlessly weaves it into the story. The ease with which I could see both the past and the present coming together is a testament to Kearsley’s writing abilities. Not everyone can pull off something like that without making it feel cheap, forced, or odd. I can’t imagine this story without the touch of the past and the story that accompanies it; it is what makes this story so brilliant. I loved the people in this novel, Peter and Granny Nan best. They were such characters that they didn’t even feel like characters in a book. They felt like real people whose words were transcribed for the novel. Everyone, even the more deplorable characters are written so well, you can’t help but like how bad they are. I don’t want to give too much away, because this is a book you need to let unfold slowly, but I will say that even though I saw the ending coming, I still let out an “awww” when I reached it. After only reading two of Kearsley’s novels, I know she’s an author I’m going to watch and buy obsessively. She does with history what I wish I could do; bring it into the present and weave it in so masterfully, it’s hard to know where the past ends and the present begins. This is definitely a must read book and a must read author. This entry was posted in Contemporary, Historical Fiction, Mystery, Thriller, and Suspence, Something a Little Different, The Must Reads and tagged Contemporary, Fantasy, Historical Fiction, Must-Reads, Mystery/Thriller, Paranormal, Susanna Kearsley, Suspense.